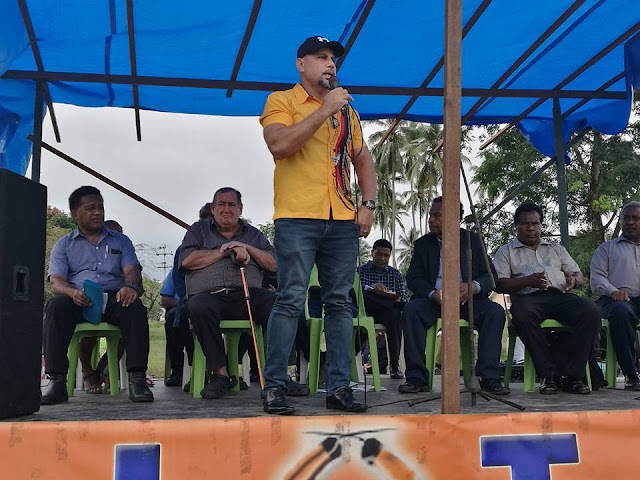 Streetscaping for a Milne Bay Mall in the township of Alotau and upgrade and rehabilitation of its’ town roads was launched this Monday by Deputy Prime Minister and Alotau MP Charles Abel. What had been planned for much of 2017 now gets underway, work on making Alotau tourist-friendly with modern day amenities begins, a target for this first phase is set for September to coincide with the country’s Independence and Alotau Town’s 50th anniversary since it’s headquarter transfer from Samarai Island. And residents of Alotau Town are being cautioned, this will take a non-stop hard effort to reach the September target, it will be months of traffic interruptions, noise and a few inconveniences but all promised to be worth it in the end. This first phase is under a funding tranche of K5million from the Department of Works for Alotau Town roads. Abel says, “What’s gonna happen is a drastic change to the face of Alotau Town, involving modernization to fit with the times and people's attitude must change to suit the kind of change that's coming". He says once complete, the township will have walkways, restaurants, toilet facilities and lots more associated with being tourist-friendly. This is the beginning of the process with the World Bank Tourism Development Program administered the PNG Tourism Authority which will come onboard straight after, for similar major developments in Alotau, at least half of the US$20million funding grant is for Milne Bay, East New Britain gets the other half. As it is, shops in the heart of Alotau’s central business area are already doing their bit, working together to bring uniformity to all their shop fronts so this first phase will blend them in altogether for a nice finish, easy on the eyes. The first phase will be the basic foundation of this major change in Alotau, including the resurfacing and rehabilitation of the town’s CBD, installation of proper taxi ramps and car parks on the fringes of the CBD area, before the second phase kicks in under the World Bank to include sitting areas, restaurants/cafes to be leased out, toilet facilities, street lighting, CCTV and much more- to be a pedestrians only, no vehicle zone. The deputy prime minister unveiled a billboard in Alotau to signal the official launch of this major re-development project for Alotau Town this Monday.